This is a delicious sauce that is perfect for adding flavor to any dip or appetizer. It’s not too spicy, but after it’s cooked you can taste the kick a little more. It’s definitely a mild/medium spice level. The sauce is orange-ish red with black speckles throughout. It has a runny thin texture, so be sure to shake before using. The heat comes from the aged cayenne red pepper, but is nothing too intense at all. It’s a sauce anyone can enjoy no matter their heat level tolerance. The sauce has very few ingredients, but you can definitely taste them all. Overall, it’s a flavorful sauce that is the perfect addition to any Sunday football recipe. This sauce has a thin and runny consistency. It’s orange-red in color with little black speckles throughout. You can totally smell the red pepper, garlic powder, and distilled vinegar. It smells almost exactly how it tastes; the aged cayenne red pepper is definitely the majority of the smell. It has a mild-medium spice level. It has a little more spice than a completely mild sauce, but it’s really not that spicy. I would say that this is a sauce anyone can enjoy because it doesn’t burn; it has only a little kick to it. This sauce immediately reminded me of buffalo sauce. If you have ever had buffalo sauce, you would definitely be able to taste the similarities… only difference is this sauce has a little more of a kick. You can totally taste the cayenne red peppers and distilled vinegar, but the mix of ingredients really creates an overall balanced flavor. 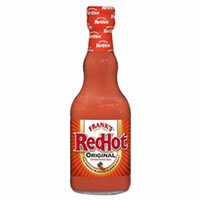 Frank’s RedHot Original sauce has a very small number of ingredients- Aged Cayenne Red Peppers, Distilled Vinegar, Water, Salt, and Garlic Powder. This mix of ingredients really creates a simple but tasty sauce you can use in a multitude of recipes. When I added it to chicken and allowed it to cook a bit, the sauce developed a little more of the spice and vinegar taste. The sauce definitely seemed stronger after it had been warmed up. 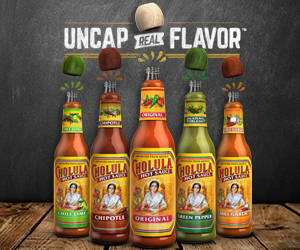 The 5 oz bottle costs $5.36 That’s an affordable hot sauce! I couldn’t find any guarantees on their website.